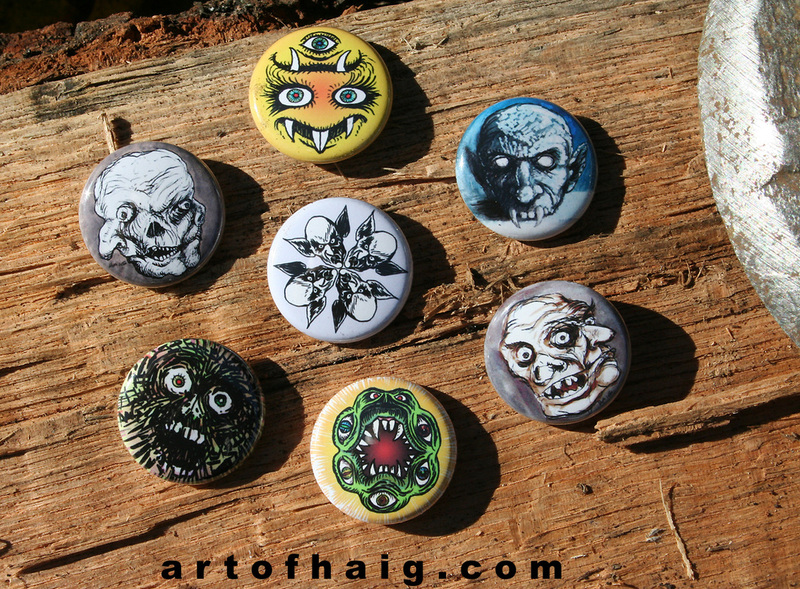 When the good folks at Goatworm Industries decided to launch a series of limited edition artist buttons they invited Haig Demarjian to produce seven designs. Lil' Yella JanusKopf -- he/she bewitches and beguiles even when spun upside-down. Or is that downside-up? Ol' BlueSkull may appear to be a tabletop model missing a mandible, but is menacing nonetheless. I wouldn't get my fingers or toes near the fangs. BorgnineKopf is a variation on the "JanusKopf" motif (meaning "head of Janus", the 2-faced Roman god, also the title of the first film adaptation of Jekyll & Hyde). One of the faces resembles someone named Borgnine. Rondelle Hatton Button celebrates deformity... in the round! Ugly no matter how the button is turned. Fried Chimp is, well... an electrocuted simian I guess... hard to tell what with all the screeching and charring. Trifecta is another JanusKopf... but this time with THREE visages mashed together. Yummy! Orlok Shuriken -- that's right... ol' Max Shreck himself in something of a THROWING STAR MOTIF. Makes you want an actual Nosferatu throwing star.